During member questions, Mr. Coleman claimed that considering prior land use on cropland converted to corn as a result of the RFS was an inappropriate way to examine the impact of the RFS on carbon emissions. Do you agree? Why or why not? No, I do not agree. In fact, failing to consider prior land use results in a serious error in carbon accounting. See "Bringing Biofuels Back to Earth" for an explanation of why it is crucial to include prior land use and its carbon uptake when analyzing biofuels. Mr. Coleman also asserted that the structure of the Clean Air Act, carbon accounting, and the nature of agriculture markets discount your method of carbon emissions analysis. Is he correct? Why or why not? No, he's not correct. As part of the Clean Air Act (CAA), the RFS requires EPA to account for lifecycle GHG impacts but does not specify exactly how that should be done. The CAA gives EPA discretion on how to implement its provisions and it does not a priori "discount" or otherwise forbid any particular method for evaluating the lifecycle GHG emissions impacts of fuels. Asserting that the "nature of agricultural markets" discounts my analysis is nonsense. Markets can be assessed by any number of carbon accounting methods; some will have integrity and others may not, just as is the case for accounting methods applied to financial markets. My work points out the lack of environmental integrity in how fuels-oriented LCA methods account for carbon flows tied to agricultural markets. Was there anything else discussed at the hearing that you would like to correct for the record? He said that the RFS has been effective in "breaking the oil monopoly." It's true that the world oil market is subject to manipulation at times by a "clumsy monopoly," as the late MIT economist Morris Adelman termed OPEC. Nevertheless, the fact that oil is the largest source of commercial energy in both the United States and worldwide is not a result of monopoly power; it is a result of the incredibly high value that consumers and global economies place on petroleum products. Moreover, advances in petroleum production have resulted in lower prices and a large savings for consumers that have nothing to do with the RFS. As for the claim that "We need the RFS because we can't get shelf space," if biofuels were competitive products they would readily find space in the fuels market. The real problem is that neither ethanol nor biodiesel have true economic or environmental value. 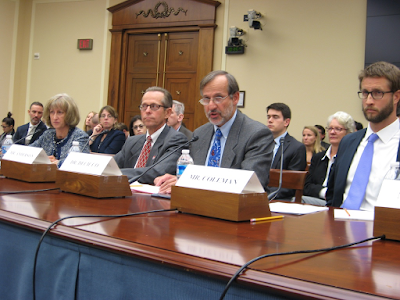 During the hearing, Mr. Coleman said that I use a "provocative" carbon accounting approach that is "not well supported. And it's called additionality." That statement simply underscores his lack of knowledge about carbon cycle science and Intergovernmental Panel on Climate Change (IPCC) guidelines, which include a section on "Baselines and Additionality." Finally, Mr. Coleman pointed out that my findings are at odds with those of agencies that have analyzed the issue. But that's the point: my research challenges the prevailing wisdom. I'm not alone among scientists who are uncovering serious errors in government-sponsored biofuels analyses. Scientific progress involves a sometimes painful process of questioning assumptions, and that is what is underway now on the topic of the RFS and similar policies to promote biofuels.